Former site of Helgren’s Landing will be revamped to create a new marine-life experience. OCEANSIDE — The impending move of Oceanside SEA Center into its new home at one corner of San Diego County’s northernmost harbor has barely created any dust. Chatter of such dust settling, accordingly, would be premature. Yet that did not stop Ernie Prieto from inviting The Log over to the former Helgren’s Landing headquarters and sharing a vision of the future. A lifelong fisherman and native of Los Angeles, Ernie Prieto, who is partnered with Capt. Joe Cacciola of Sea Star Charters, relocated his family to northern San Diego County to help bring the magic of the Oceanside SEA Center to life. Previously, Prieto moved Chubasco from Long Beach to Mission Bay to operate Chubasco Sportsfishing in 2001. An acronym, the “SEA” in Oceanside SEA Center stands for sportsfishing, education and adventure, perfectly describing the shared vision of Prieto, Cacciola and their team in a nutshell. A collective concept, Oceanside SEA Center will bring the worlds of fishing and marine science together with an unforgettable experience. With the enthusiasm of a kid on Christmas morning, Prieto gave The Log the grand tour of planned Oceanside SEA Center, a building that for now one needs a little imagination to envision. 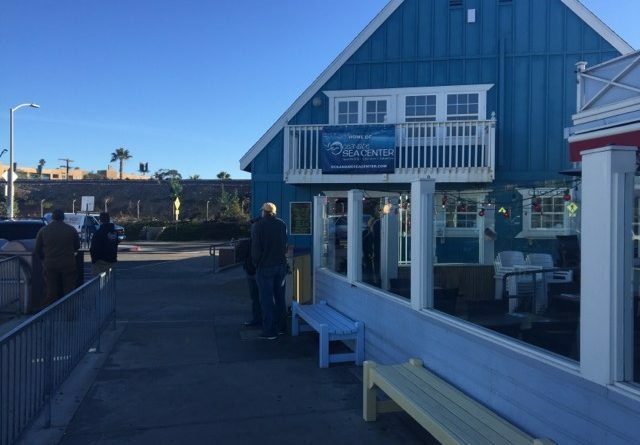 When Prieto and Cacciola signed the lease for Oceanside SEA Center, it was sight unseen, partially because these kinds of properties are so rare to come by, but mostly because they believed in their dream. Prieto sees many grand plans and new attractions for lovers of marine life and fishermen alike to enjoy. Downstairs there will be an area for sportfishing and ticket sales. There is already a cash register upfront, but it’s positioning will change with the renovations. In the back, there might be a few aquariums and Cacciola may host a series of marine-related classes or discussions; Prieto mentioned Cacciola has quite a bit of experience in this area. Visitors will also be able to purchase sundries such as sunscreen, T-shirts, some tackle products, and other “touristy” products. The Pfleger Institute of Environment Research (PIER) will operate upstairs. PIER generally studies and researches the fish, but for the purposes of the SEA Center will concentrate on some of the fishable creatures such bluefin tuna, calico bass, halibut and yellowtail. PIER joined forces with Cacciola and Prieto to research and provide data to ensure less than 1 percent of the fish will be harvested, protecting the interest of consumption. Genetic studies will also be done on the fish in the area to see if any mutations are caused by the surrounding environment. A restroom will also be placed upstairs. Currently, the building has been without water for 10 years. At one point it was turned off by the previous tenant, causing the pipes to corrode and costly repairs were needed in order to get the restrooms up and running again. The renovations do not stop indoors, either. New concrete floats may be installed to house marine life and storage, and a wet station with sinks and running sea water to view specimens may also be added. These stations will be completely self-sufficient and will offer a hands-on experience, perhaps a touch tank. Four boats are currently owned by Oceanside SEA Center. One of their newer boats, Southern Cal, is in need of renovation, but will likely be used for half-day trips on the sea and whale watching. Prieto is also planning on a new color scheme for the building. He envisions a brick red façade with canvas trim. City officials, of course, would have to approve of any color scheme. While the renovations seem to be going well, there has been a lot of recent controversy and challenges that came from the SEA Center being built. Prieto would like to clear up any rumors about what has been going on with the new Oceanside Sea Center. “I think there are a lot of misconceptions about what we are doing here,” Prieto said. By partnering with PIER Institute, he hopes fishermen and scientists can come together for both parties to enjoy the ocean. One thing Oceanside SEA Center is not: an attempt to shut down fishing activity in the name of scientific research. A trend apparently opening up for fishing and marine-related attractions, and one that Prieto has already enabled, is the use of online resources to book reservations. Chubasco was the first sportsfishing boat with online booking, a practice expected to continue at Oceanside SEA Center. In the interest of the Oceanside community, Prieto and Cacciola went to community meetings and hope to keep the center in the spirit of what previously existed, to an extent. It has been a long road to get the Oceanside SEA Center to where it is now, but in May, Oceanside SEA Center is on schedule to be completely renovated, with indoor plumbing and a plethora of other attractions for guests. At the end of the day, Prieto hopes this new center will be a place where all people, scientists and fishermen alike, will be able to come together despite their sometimes differing. “I envision this as a meeting place,” Prieto told The Log. From the number of attractions available, it appears there will be many opportunities to experience the marine life, no matter what your interests. Oceanside SEA Center is located at 315 Harbor Drive South. To find out more information, visit their website at oceansideseacenter.com. Learn more about PIER at pier.org. So excited got you guys & our city. Beautiful opportunity for learning & discovery! !